It was hard to know what to expect. I had never been to Brasil, let alone South America. I was leaving the end of winter and arriving at the beginning of fall, as if time were working in reverse or speeding up and skipping seasons. 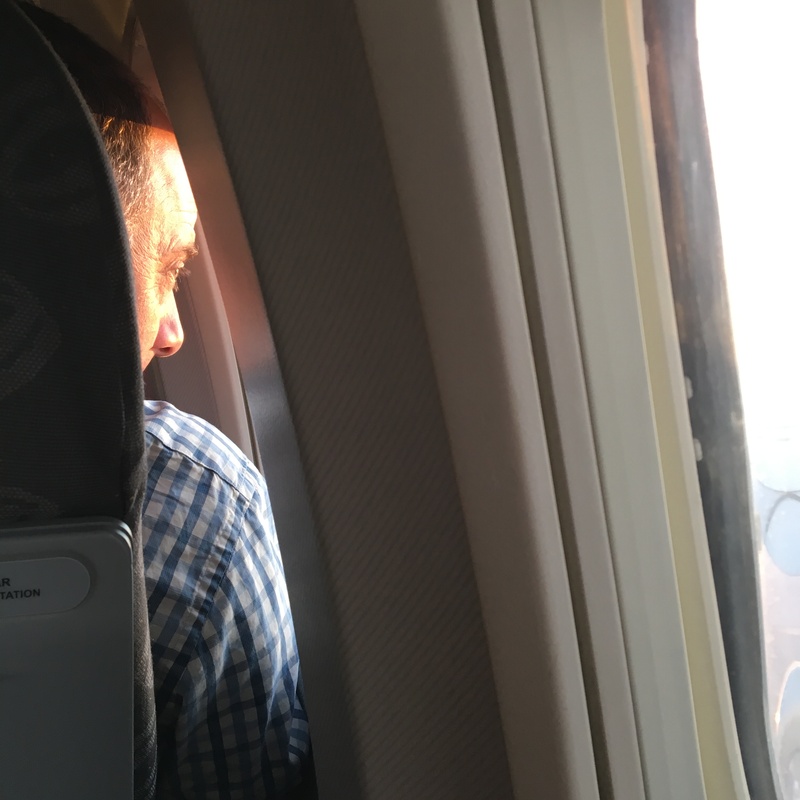 As far as air travel goes, the flights (three of them) were all on time and remarkably stress free. In the blink of an eye, after falling asleep watching The Martian somewhere over the Amazon rainforest, I was in São Paulo, the biggest city in the Southern Hemisphere. 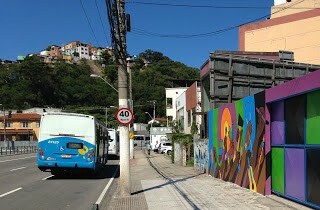 I would be back later in the month to do a mural with Parede Viva, but then it was just a connection on my way to Vitória, the capital of Espírito Santo. Upon my arrival, I was met by Carla Waehneldt and Beata Angelica from the U. S. Consulate, who are helping to coordinate my visit and got me to my hotel. I put my luggage down, and as I scanned the picturesque scene below my hotel window facing the ocean, I began to notice all of the yellow and green shirts and flags moving towards the bridge that connects Vitória to its older twin city, Vila Vehla. There were streams of them, young and old, on bikes, in cars, walking all in the direction of the bridge. It was a protest, a massive protest in Vitória and across the country. Looking back at the long swooping bridge high above the water, it had turned completely yellow and green with protesters, like a field of dandelions moving ever so slightly to the south. Traffic was blocked, until dusk fell and the crowds reversed their course, heading home as if they had been at a holiday parade. That was my first hour in Brasil. A deep disorienting sleep of the traveler. 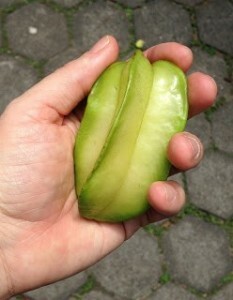 Breakfast buffet – so many delicious fruits! I met with Carla, Beata and the local Secretariat of Culture, Fernanda, to discuss the role and interests of the U. S. Consulate in the project. And then finally I saw Karen Valentim, my artist counterpart, and Roger, our affable translator. We had met (sort of) on Skype so it was a relief to see each other for real. I liked them immediately. 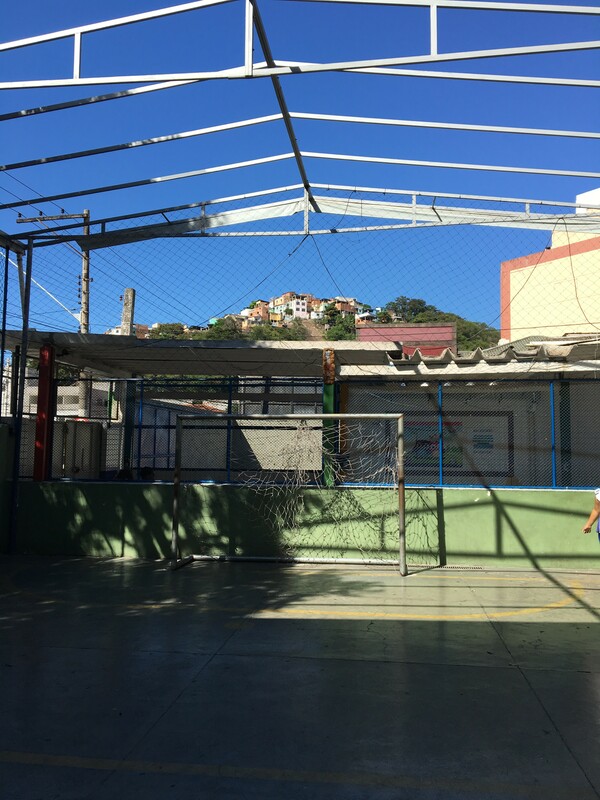 After some orientation, we walked over to Escola Municipal Maria Leonor Pereira da Silva ten minutes away, through a streetscape not unlike downtown Kansas City. 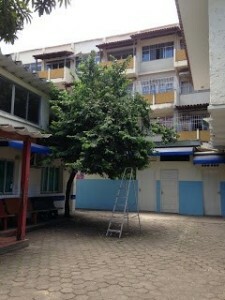 Here’s the front of the school – our ‘before the mural’ shot. 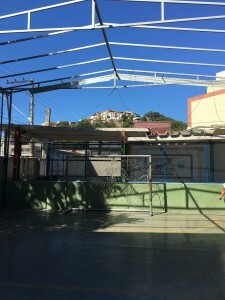 The Escola Municipal Maria Leonor Pereira da Silva faces a busy street near one of the three comunidades (favelas) where many of the students come from. Except for the official state sign indicating there was a school there it was hard to tell. We had work to do. On the first day there, I met with our teacher and administrator counterparts, Rosalba, Dulce, and Sabrina. They were energetic, welcoming and forgiving of my lack of Portuguese. They had also dreamed of a mural for their building for a long time. From inside the school, you can see the comunidade where many of the students live. For us to make a collaborative artwork that is imbued with meaning, beauty and reflects our individual voices while responding to the many audiences that will see it, requires that we know each other and the place we are working – even in a short process like this. So to begin we shared stories in a circle. Each person got a turn (including the grown-ups) without interruption or questions to respond to the day’s prompt. In Vitória, we started with sharing our favorite ice cream – there are so many delicious flavors here. We went around with the morning group of teens and learned this first thing about each other. It is simple, but even a simple question like this elicits laughs, memories and new connections between those who discover they share favorite flavors. Everyday after we began with a similar circle and a different prompt, the final one being, what have we forgotten / what’s missing from our mural? There is always more to be done. Then I gave a presentation, showing pictures of my murals and sharing some of the stories behind them. Karen followed, doing a remarkable job of describing her role and the overall concept of the project, which would focus on the idea of social inclusion and shared values between Brasil and the United States. Roger (who said, “I’m not a translator. How did Karen get me into this?”) did a great job of translating not only the words I spoke but also my sense of emotion and pacing. Those stories, I say, are just as important as the murals, and in a way our mural will be a key or touchstone to unlocking the memories of the time we spend together. I end my presentation with a picture of the wall outside the school we will be painting. 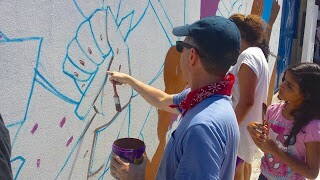 The group gasps and says, “Ahh.” We took a break, walked outside onto the busy hot sidewalk and examined our wall – what it looks like, feels like, how tall and long it is, and what painting or writing already exists on it? 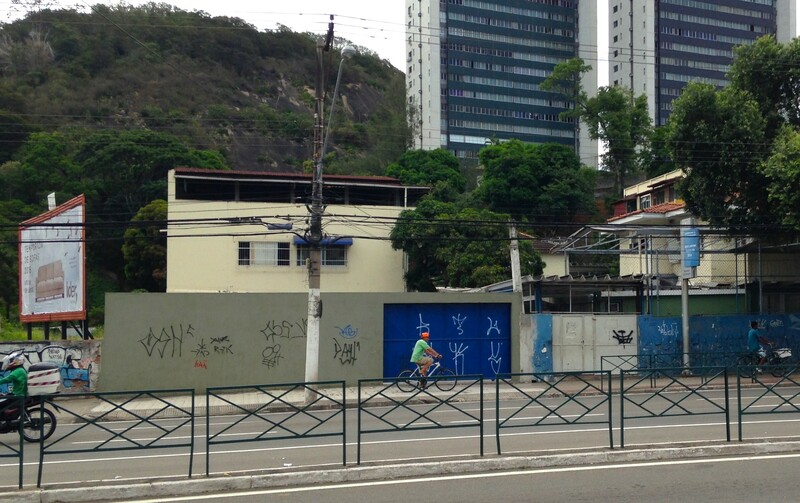 A couple of the students pointed up toward the comunidade on the hill. 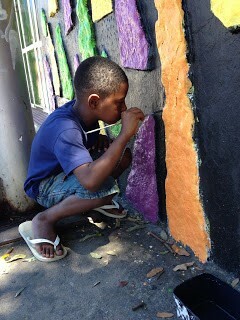 That’s where they live, and Gustavo (a very promising young artist) says he can even see the mural wall from his house. The excitement builds, but also a sense of responsibility and awareness that there is hard work ahead. We talked about our expectations for each other and the mural. 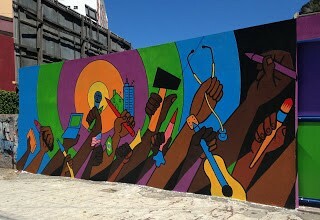 I wondered about my role as an outsider from far away – a white guy from the U.S. leading a group of mostly black students from Brasil on a mural about social inclusion. I am accountable to them and need to ensure their message is portrayed the way they want. That evening I took a taxi to the Centro neighborhood where Karen had curated an exhibition of photos about her trip to Juarez, Mexico, with other women artists in 2013 at the Mucane African Heritage Museum. I got meet some of them. We talked about the U. S.-Mexico border and the tragedies of Juarez. 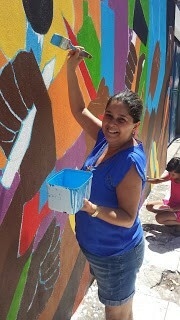 Karen’s group, Feminem, went to make art on the streets that affirmed the rights of women and condemned the brutal violence. The exhibition and the short documentary that went with it were tough and beautiful. 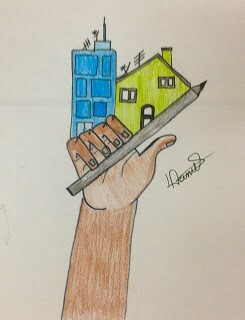 Later in the week, I was invited to give a short talk and participate in a conversation about urban art. We met in the Centro at a beautiful old building. The group that came was diverse and included a museum curator, an established street artist known as Fredone, a father and young son, a traveling poet, and others. Our wide-ranging chat touched on the story of the street artist Blu painting over his work in Bologna, and the similarities (and differences) between Brasil and Kansas (mostly about politics). Lunch breaks together with Roger, Karen and guests were times to talk about what was happening in Brasil nationally and in Vitória locally. 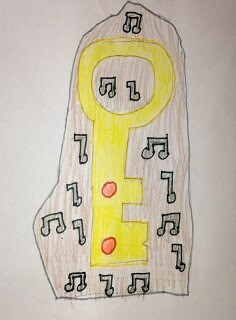 I began to understand that the current situation and protests it has spawned are much more complicated than I realized. One other great side trip was seeing the collective workshop where women make the clay pots called panelas used for cooking Moqueca Capixaba, the delicious and celebrated seafood dish from Espírito Santo. The first painting day was a Saturday. I got there at 8 AM to start mixing colors (I am the bartender or barista of paint, I tell the team). Despite the heat, 30-40 people showed up, including most of the students plus parents, friends and relatives. A big group set up chairs in the shade to watch. Passersby were curious and stopped. “Muito bom!” and “Parabens!” are what we heard most. 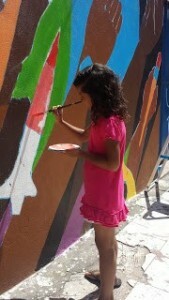 On Sunday the mural really started to take shape. 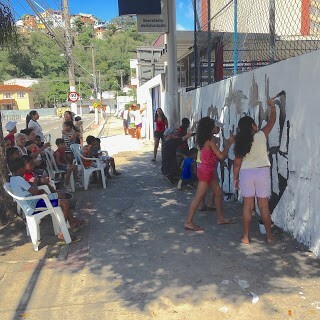 A dedicated crew of painters worked hard from 9 to 12, when we stopped so a bunch of us could go get authentic Moqueca Capixaba on the other side of the Island, followed by a great tour of street art in old Vitória led by Karen. The final two days of painting focused on a smaller crew, including a few of the most committed students plus Roger, Karen and Athena from Meridian who probably hadn’t packed for painting… Tuesday morning was our mural (tentatively titled, “To Work Together is Victory”) dedication breakfast. 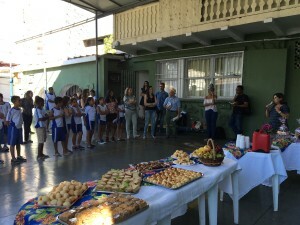 Many special guests came and gave speeches, including the Secretaria da Cultura for Espírito Santo. Gifts and hugs were exchanged. A TV channel did interviews with many of the students. We all agreed that this was only a beginning. 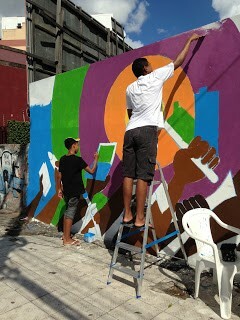 After all, there was paint leftover, plenty of walls and newly trained muralistas with lots of ideas. And then, just like that I was on my way to Rio. I am grateful to all of the students, teachers and administrators of Escola Municipal Maria Leonor Pereira da Silva for their extra effort in making this project a success. Special thanks to: Karen, Roger, Carla, Beata, Fernanda and Athena. 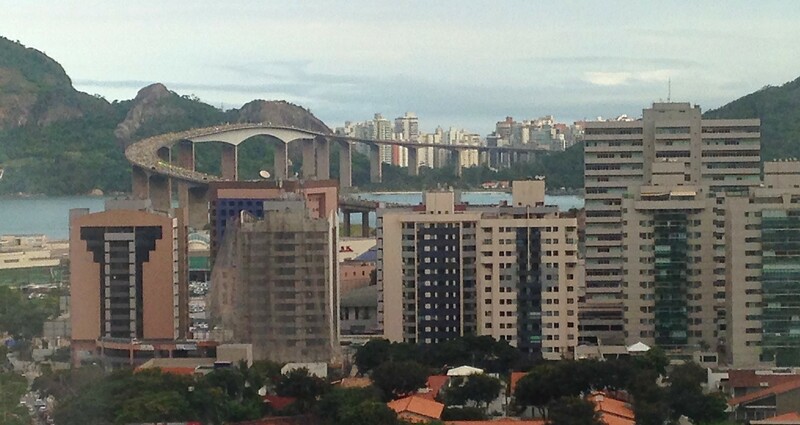 Looking out over Vitória as I head to the next city, Rio. 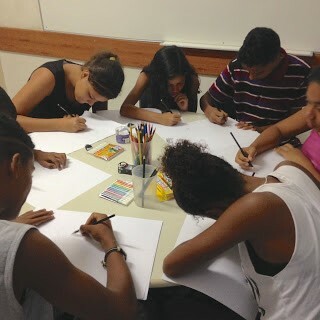 Next up…working with artists from Oi Kabum! 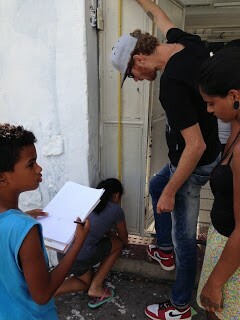 in Rio on an installation about the Summer Olympics. POST TAGS: Arts, Community Engagement, Cultural Diplomacy, International Exchange, Mural Arts, U.S. Department of State.